This double moisturizer offers a vitamin-packed moisturizing system that you'll love whipping-up. Its silky touch comes from its 2-part, hand-filled mixture of cooling aloe gel and shea butter. Live Strawberry Cells have been suspended in a nourishing aloe gel to bring supple softness to skin. 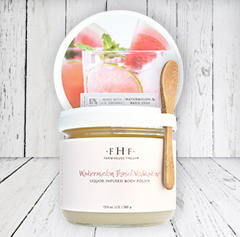 The other half, rich shea butter, blends with the strawberry fruit extracts leaving skin dewy and naturally fragranced with strawberry-grapefruit-liciousness. Includes a wooden mixing spoon and a printed jute tote for gift-giving delight, declaring "Mushed-up stuff is better for you." Live Fruit Cells, Blood Orange Oil, Shea Butter & Aloe Vera, Vitamin E.
Live fruit cells suspended in Aloe Gel deliver nutrients intact to skin for vitamin potency - vitamins A, B1, B2, B3 & C, Potassium, Magnesium, & piscidic acid. Soybean Oil, Shea Butter & Aloe Vera improve skin�s hydration and elasticity, alleviating dryness. Aloe Barbadensis Leaf Juice, Water/Eau, Glycerin, Glycine Soja (Soybean) Oil, Polysorbate 80, Butyrospermum Parkii (Shea Butter), Cetearyl Alcohol, Ceteareth-20, Cetyl Alcohol, Stearyl Alcohol, Parfum*, Fragaria Vesca (Strawberry) Fruit Extract, Oryza Sativa (Rice) Barn Oil, Ethylhexyl Palmitate, Dimethicone, Cyanocobalmin (Vitamin B12), Tocopheryl Acetate, Menthone Glycerin Acetal, Carbomer, Disodium EDTA, Tetrasodium EDTA, Sodium Hydroxymethylglycinate, Sodium Hydroxide, Phenoxyethanol, Caprylyl Glycol, Potassium Sorbate. *All FarmHouse Fresh fragrances are phthalate-free. Recommended for normal to dry skin types. Perfect for dehydrated or sunburned skin. Mix rich Shea Butter and cooling Aloe Gel parts together with a spoon and rub in for a decadent treat! I absolutely love how my skin feels after applying this moisturizer!! It smells amazing too!! Highly recommended!!! 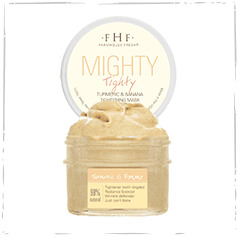 This is my absolute favorite FHF moisturizer! I have used it for years. I really like the way the two textures of this product blend together. It leaves my skin feeling soft and nourished after use. My skin also looks refreshed after use. I get dry skin and am eczema prone. This moisturizer has been great for me. It helps soothe my dry skin without irritating it. It also has a great scent. I highly recommend this product!